Deepening Drought In Western U.S. Costs Ranchers Money And Heartache : The Salt Because his profits are tied to rain and snow, one Oregon rancher will have to pay thousands to haul water and grass to his cattle in the mountains. And the land just continues to become more parched. 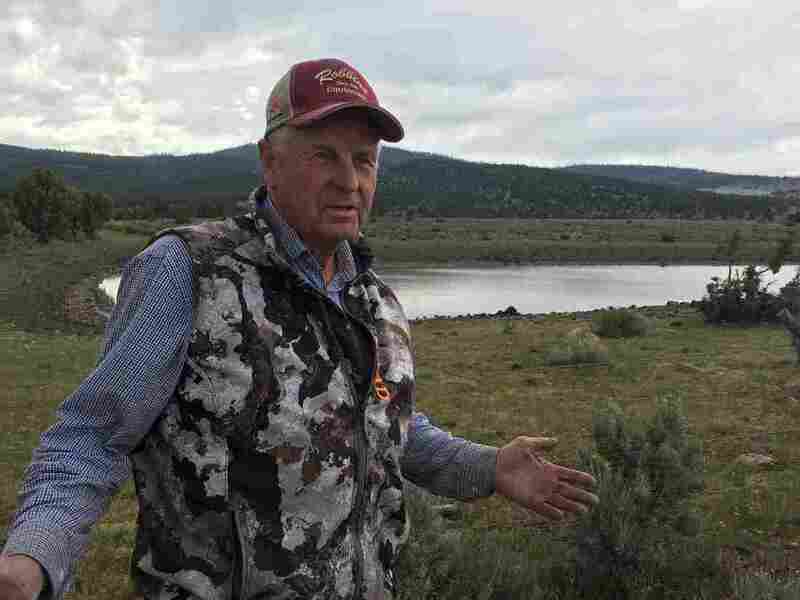 Southeast Oregon rancher Rancher Wayne Evans says he'll make it through this short water year, but it could cost him as much as $100,000 in lost hay, lost weight on his calves and equipment for hauling water to his livestock. In the shadow of remote Dry Mountain in central Oregon, branding is the only way to guarantee a fair sorting of cattle among ranchers in the fall. Ear tags can rub off in the rough, sage-studded country. So each year, before cattle are let out to graze on the summer range, the young are branded, castrated and vaccinated. Neighbors gather in the early morning to do the work. A gritty fog of dust and campfire smoke washes over the scene, stinging eyes. Children duck behind the woodpile to avoid an upset mother Angus hellbent on protecting her captured calf. The ropers on horseback, called headers and heelers, hustle to brand 300 calves by noon. Over the sizzle of the irons on fresh hide, the worried talk among these neighbors is about the deepening drought. "This is not normal for what we normally have here," says Wayne Evans, the owner of Dry Mountain Ranch. "This is a lot drier." His place spreads over 100,000 acres of private and public lands, and he runs nearly 2,000 head of cattle. Evans is part cowboy, and all business. His profits are tied to rain and snow. Even in a good year, there's still little rainfall here — around 11 inches average. On an afternoon tour of his spread, Evans points to irrigation water trickling from a culvert. "That will be dry in two weeks," he says. And that's the problem. This ditch is 9 feet deep — and last year it was so full that water was flowing over the road. But this year, light snowfall, fewer storms and warm spring days have brought one of the worst droughts Evans has seen. Oregon has already declared drought in several counties, with two more under review by Gov. Kate Brown's office. And that's a common theme: Drought is stretching across the Western United States. Evans has about 50 waterholes, and most of them are dry. Down the road, he stops at one that his cattle use in spring and fall. He says it's usually full now. But this year: "You could ride a horse across there and wouldn't even get your feet wet," Evans says with a grim chuckle. This drought is going to cost Evans. He'll need to hire someone to truck 8,000 gallons of water along with expensive hay up to his cattle in the mountains every day. He'll pay for the diesel, a full time employee, constant repairs to the truck and at least 10 big, pricey tires. On top of all that: When cows have to walk farther for water, and they have less grass to eat, they produce less milk for their calves. "So when those cows don't milk," Evans explains, "those young calves don't grow like they should." Lighter calves means, at this winter's stock sale, Evans could make $60,000 less than in a good year. And he already sees signs that his water problems might stretch beyond this year. The aquifer here is stressed, and the state has imposed a moratorium for new groundwater rights for the Greater Harney Valley area. The fact is, many Western aquifers, wells and rivers are declining or coming up dry. At brandings in southeast Oregon, kids begin to learn ranch work at a young age. 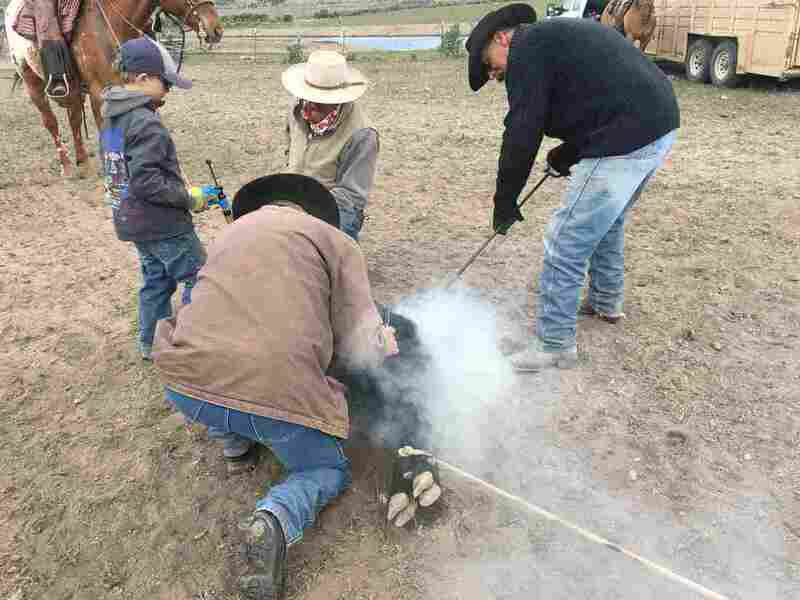 Often, they are put in charge of holding horses, vaccinating cattle and keeping branding irons hot in the fire. "We can't continually take more water than is going in, otherwise we'll drain it," says Erick Burns, with United States Geological Survey. He's leading a large study of aquifers in the West, including in eastern Oregon. He says the volcanic rock and soils in the region don't store much groundwater. In places like this, 90 percent of the water is used for agriculture, he says. "So, when you want to think about how you want to use your water — as a state, as a people, as a community — agriculture has to be a part of that discussion," Burns says. He says lawmakers and communities will have to make hard choices: Do they want more agriculture, city growth, wildlife or industry? Back in his pickup, Evans is still working at age 71. A key chain fashioned out of a bull elk tooth whacks back and forth as his F-350 pickup shudders down a federal Bureau of Land Management road. He says it's pretty stressful sometimes. But this is the life he wants. "I've got my kids and my grandkids, and I'm trying to leave something for them," Evans says. "This is a great place to raise kids." A bit of rain could help. Almost on cue, a flash storm pelts his truck. Evans grips the steering wheel more tightly. The storm goes as quickly as it comes — just enough to smear the dusty and bug-splattered windshield. "We need a lot of rain,"he says. "We don't just need just a half inch of rain, we need several inches of rain to make it good." In minutes, the shower blows past and the dry winds pick up again. This story comes to us from the Northwest News Network.